Edith Södergran was born in St. Petersburg, Russia, the only child of a middle-class Swedish-Finnish family. Her first language was German and her earliest poetry was written in that language. She was educated in Russia and learned to speak several languages. In 1908, she stopped writing in German and made Swedish her main literary language. At the age of 16, Edith Södergran contracted tuberculosis, the same disease that had killed her father the year before. 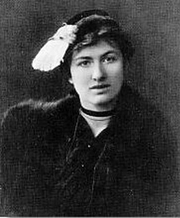 From 1911 to 1914, she lived mainly in sanatoria in Switzerland, where she started to study Italian and read Dante. In 1914 she returned home with high hopes for the future. In 1916, at age 24, she published her first collection of verse, Dikter (Poems). With the outbreak of the Russian Revolution in 1917, Edith and her mother took refuge permanently in the family's summer home on the Karelian Isthmus, on the Finnish-Russian border. She suffered from depression and extreme poverty, but produced further collections of verse, including Septemberlyan (September Lyre, 1918), Rosenaltaret (The Rose Altar, 1919), and Framtidens skugga (The Shadow of the Future, 1920). Landet som icke är (The Land that Is Not) was published posthumously in 1925. Edith Södergran died at age 31 from TB. Although she did not receive much recognition in her lifetime, she's now considered one of the first modernists and a pioneer of poetry in the Swedish language in Finland. Edith Södergran is currently considered a "single author." If one or more works are by a distinct, homonymous authors, go ahead and split the author. Edith Södergran is composed of 5 names. You can examine and separate out names.